Their are lot of misunderstanding happened on web world about a topic that Kevin Rose founder of Digg resigned,But Kevin Rose cleared it on it's tweet. In past posts of techcrunch they written that Kevin Rose doesn't use Digg anymore,Digg dropped 33% in just five months,and Digg now under pressure from social networking sites like twitter and facebook. From multiple sources he's already resigned from the company and is closing $1 million financing round for new startup he is founded. The question is in all people's mind that what he startup now?because he is active in some projects like Rivision3,fforward and private news later called foundation. some sources also said that he didn't actually "resign" from digg through ,but rather pulled back after handling over the CEO role to outside hire Matt Williams. 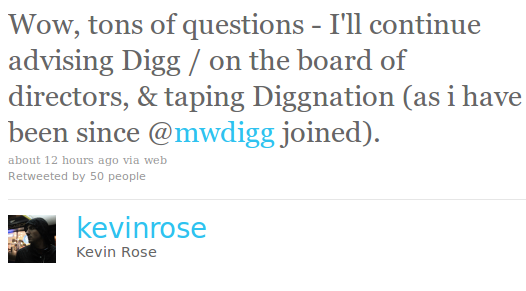 As per Allthingsd Rose called serving as interim digg CEO a "nightmare" that "i would never wish on my worst enemy".